I started Red House in the year 2000 with just one pupil. There are now dozens of students studying guitar, ukulele, bass and drums, ranging from 6 to 80, showing the truth of the old adage that it is never too late to learn. 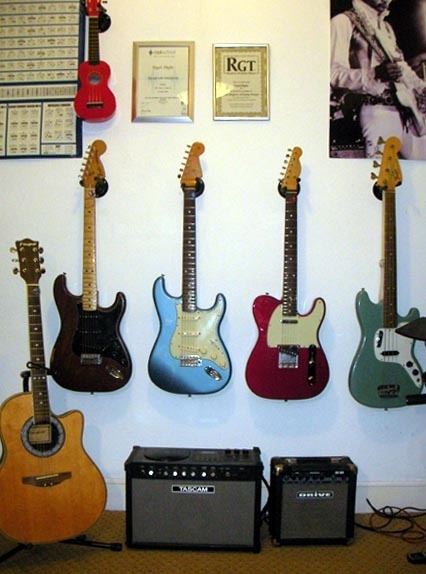 In the studio are guitars, bass, ukulele and a set of Roland V-Drums, as well as amps and other facilities. The setting is domestic rather than industrial, so I hope there is little to daunt the beginner. My qualifications for the task are 40 years of playing in semi-professional bands, starting when I was still at school, and including some local theatre work. I have Rockschool Grade 8 (Distinction) in guitar and Grade 8 (Merit) in bass as well. I am pleased to say that I have guided many others through the grade system. Each year, Red House hosts a "show", where students can demonstrate their talent to family and friends, if they so wish. I encourage them to do so, because as a performer myself, I think it is good for them to learn to play in front of other people, and eventually have bands of their own. I welcome enquiries regarding any vacancies and my fees, which are payable in blocks or individually, in cash, cheque, BACS or Paypal.